I found this article about making matches fascinating. The wonder is not the fact that you can make them yourself (it is quite easy, it seems, if you can pick up some red phosphorus and potassium chlorate), but the discussion about the volatility of the mixture in the last half of the article. It has really never struck me how lucky we are to have matches, not because they work but because they only work when needed. 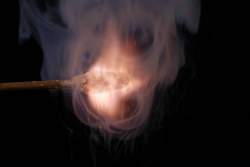 Since just a little friction causes them to explode in flames it might rightfully be argued that it is more a miracle that modern matches don’t light themselves on their own, even very occasionally. Early matches and their factories were actually quite dangerous. By the way, I found lots of other fascinating things on the periodic table table site, which is fun to browse if you are an element nerd. Speaking of elements, diving further into my web browsing journey I discovered that an important element in compact fluorescent bulbs is Europium. (That link is from this periodic table display which looks like a lot of fun.) My guess is that this is one reason they are relatively expensive.